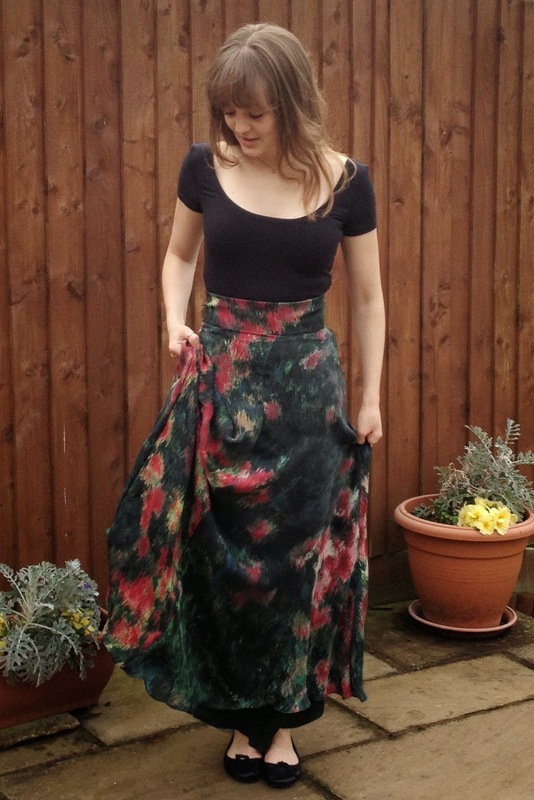 Spring finally seems to have arrived here in London, which is a good job as I jumped the gun a little hoping for the warmer weather with my most recent handmade ensemble for the Mood Sewing Network! 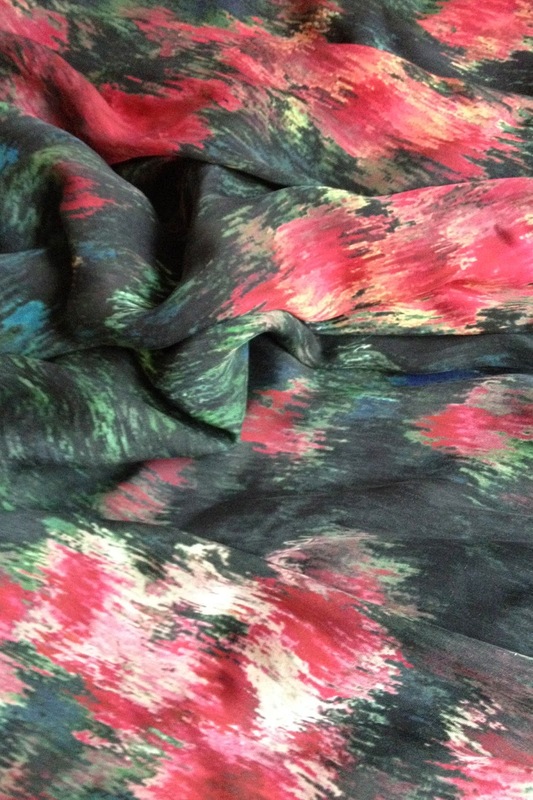 This gorgeous abstract printed silk georgette jumped out at me from the computer screen back at the end of last year and I couldn’t resist using that month’s allowance to snap up a few yards despite my plans for it being a garment more suited to the warmer months! It’s exactly the kind of organic and non-descript print that I like; to me it looks like a kind of blotchy pixelated floral. In reality the colours are a bit more vivid than it comes across in these garment photos and it’s got a gorgeous smooth hand and drape. The picture below does the print a bit more justice. If you haven’t come across a silk georgette before I always think it’s like a chiffon but heavier. Most have a slight crepe-like texture to them, as this one does, and while not as sheer as chiffon they are not opaque. Bearing this in mind (and knowing I would end up making a summer dress or skirt from it which would be worn in bright sunlight) I ordered a couple of yards of this Theory dark green stretch silk georgette to line/underline it. I deliberated over this choice for quite some time as I wondered it choosing a lighter or brighter colour for the lining would bring out the colours more but when it arrived I was delighted with the colour match and weight of it when combined with other piece. This georgette is slightly different to the first as one side of it has a satin like sheen which makes it lovely to wear against the skin. 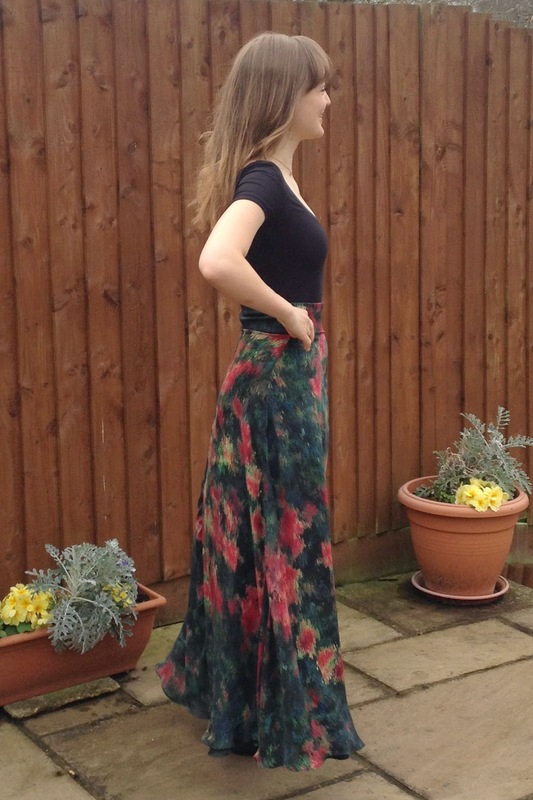 I had initially thought I would make a fairly simple dress with a flared skirt but a couple of days of sunshine reminded me of my ongoing love for maxi skirts in the summer months and also got me thinking about a vintage maxi skirt pattern which I’ve had in my stash for a while; Style 4218 from 1973. I knew these two fabrics were going to be a fairly tricky combo to sew with so the simple four panelled design and waistband looked like a perfect choice. Because each panel is so full at the hem I only just managed to squeeze my pieces out of the 2.5 yards I had ordered and therefore thinking about pattern placement wasn’t really an option! I had thought this wouldn’t be a problem as the pattern is so abstract but in fact the majority of the colourful blotches run closer to one selvedge than the other so as I could fit two panels across the width of the fabric one panel ended up darker and less colourful than the other. As the print is fairly uneven throughout I don’t actually mind how it looks assembled in the end but I wish I’d had a bit more fabric so I could have played around with the spread of the colour. So there’s a lesson for you all and one I won’t forget again…when working with a print of any kind it’s always worth ordering a little bit extra! As georgette is semi-sheer I debated using the dark green as an underlining so all the seam allowances were concealed beneath both layers rather than between the two. But in the end I decided the top layer was opaque enough to prevent any of these insides showing through and used it as a lining. 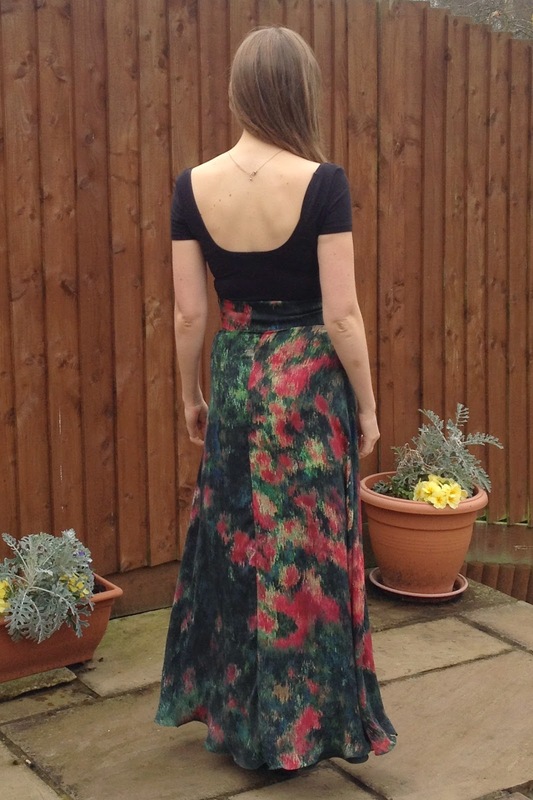 I’m really pleased that I kept it separate to the top layer as having it hanging free gives some really gorgeous extra fullness and movement to the skirt…although it did mean I had two huge hems to contend with! When sewing I used a size 70 sharps needle in my machine to prevent any snagging and actually my machine handled both of these delicate and rather slippery fabrics pretty well. To preserve the delicate silks I used french seams throughout with the exception of the side seam where the zip is inserted, which I overlocked the edges of before assembling. 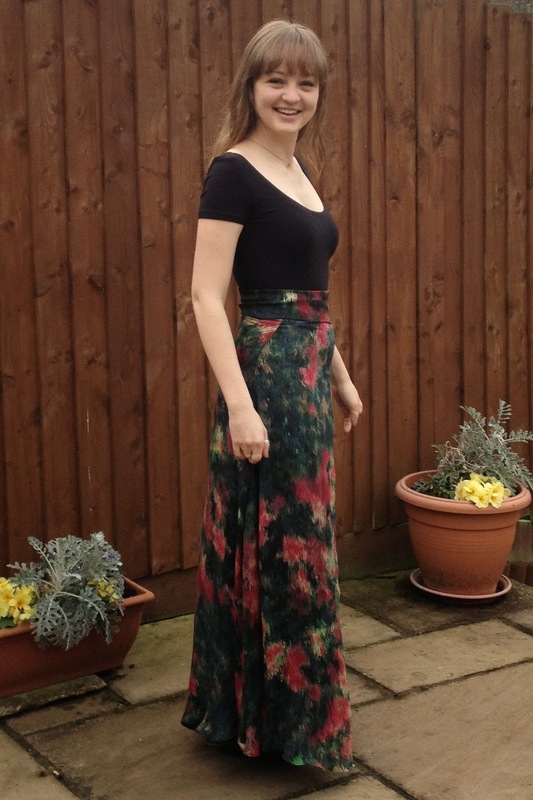 Apart from pattern placement the one major challenge I encountered with this project was levelling off the hem. I popped it on my tailors dummy overnight and by morning the hem had a dramatic handkerchief effect! It actually stayed put for a good week longer as I just couldn’t face trying to get it even. In the end it was time consuming but not too painful. I tackled the top layer first and finished it, before cutting the lining ever so slightly shorter. I used my rolled hem foot which I have found to be by the far the speediest way of hemming delicate fabrics such as these and love the fluted effect it gives to the two layers together. I actually hemmed both layers before sewing up the final seam where the zip is. This is a technique I often use when doing a rolled hem as starting and finishing at a raw edge is so much easier than along a continuous curve. Then I sew up the seam and tack down the seam allowances at the hem by hand. 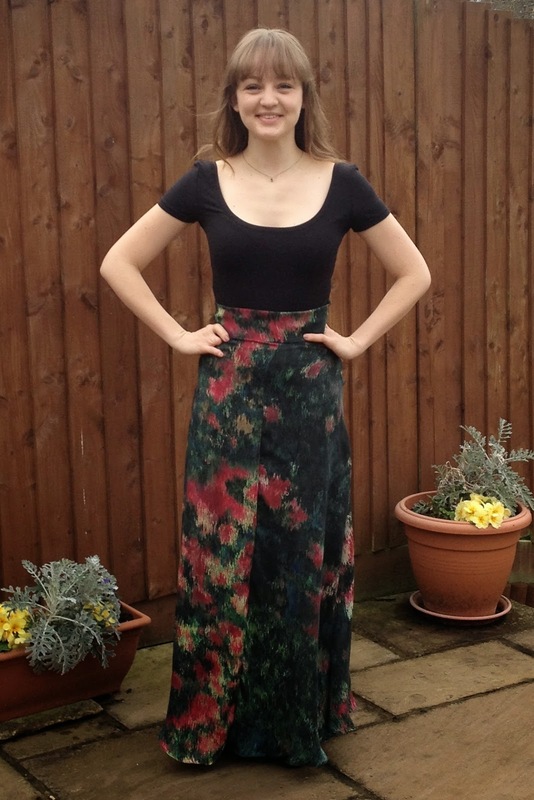 One of the interesting features of this pattern is the deep waistband which is 3″ wide when assembled. I did use the dark green georgette as an underlining on the waistband pieces to provide an extra layer of thickness and structure and hand basted these together along with a layer of silk organza as interfacing. I think this width of waistband could actually do with a bit more structure, and I’d probably add this to both the main band and facing next time. Construction wise I assembled the waistband and attached the facing, under stitching the top edge, before attaching the top layer of the skirt to the bottom of the waistband and the lining to the bottom of the facing. Once the zip was inserted I stitched in the ditch by hand to catch the bottom of the waistband and facing together and help keep things sitting correctly. The top is actually the Nettie Bodysuit from Closet Case Files which I think the close fit of makes for a great pairing with the high waist of this skirt. 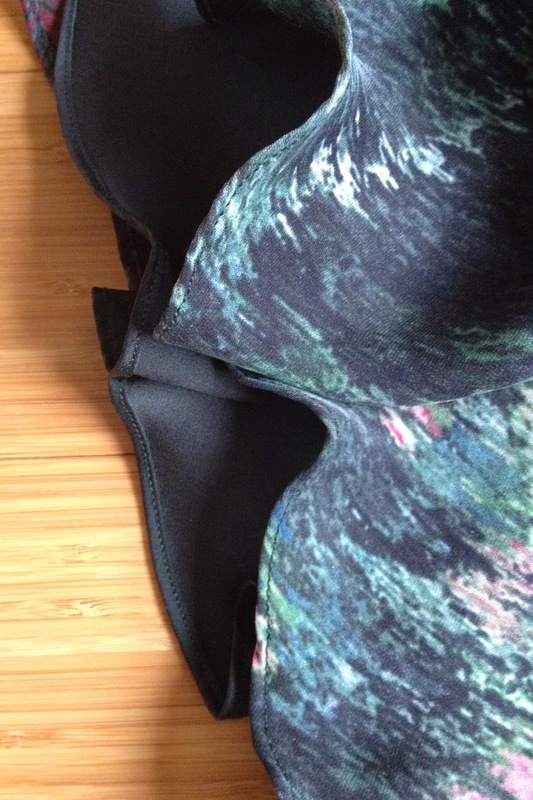 I’ve been wanting to sew with some more bamboo jersey ever since I had such success with it on my version of the Bronte Top so I ordered a small amount of a couple of colours from the selection on the Mood Fabrics website (this is the black solid which is now unfortunately sold out). This particular bamboo definitely lived up to the high expectations I had after my first experience. It’s dreamy to sew with. I chose to sew all my seams with a narrow zig zag stitch for accuracy and strength and then finished them off on my overlocker as I really like this professional look inside. Both my regular machine and overlocker loved this jersey, it pressed beautifully, didn’t shift as I cut it and for once I hd no trouble with my twin needle which I used to finish the sleeves and topstitch around the neckline and leg holes. I want to make all of my knit projects out of bamboo now; it’s so soft and snuggly to wear to boot! I actually managed to squeeze two out of the 1.5 yards of the black I ordered (the second having long sleeves and a different neckline) so I am planning to do a more detailed post about my experiences with the pattern over on my blog in the next week or so. 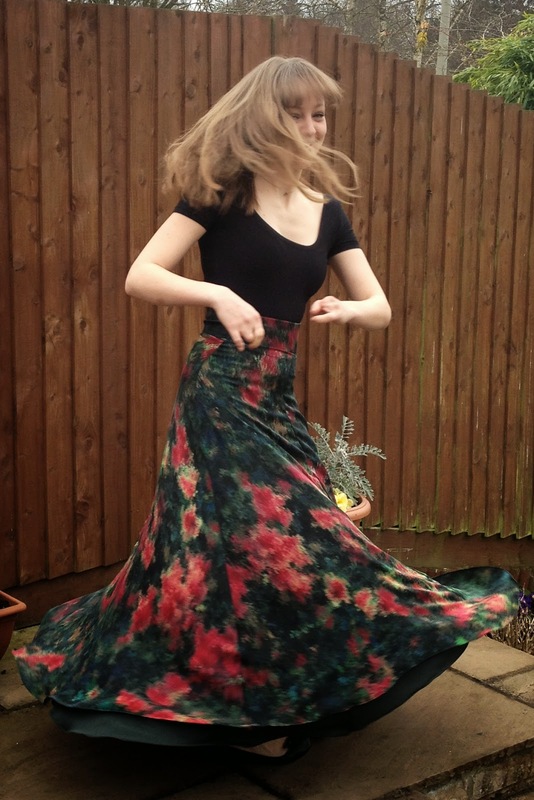 I’ll probably be wearing my Nettie with more seasonably appropriate skirts and jeans for at least the foreseeable future but I’m dreaming about wearing this skirt in the summer sunshine!